Take your sweat session outside on a lovely day for this training session. No weights, just grab some headphones and a music playlist and get outdoors! Let’s face it, the gym or home can be boring and unmotivating when it comes to working out. Parks aren’t just meant for kids, basketball and soccer players so take advantage of some open space whether it be in the sand, grass or concrete. Fresh air, sun and some vitamin D can be huge factors in workout performance, focus an dmoviation. Once at the park, you’ll find that there is actually a decent amount of equipment ready and waiting for you. A park bench is great for dips, step ups, or decline push ups and any monkey bars or straight bar on the juggle gym or swing set are perfect for pull ups. If you want to get really creative take a plastic or regular bag and fill it up with sand to use as homemade weights for your workouts. All in all, this workout has maximum benefits while getting you outside in the fresh air. Walking Lunges are a great variation to regular lunges. You can perform them with your body weight or by adding dumbbells for a challenge. If you’re using dumbbells, simply hold each dumbbell at your sides as you perform this workout. Stand with your feet shoulder width apart. Step forward with one leg, while lower your entire body and the other leg down. Be sure to keep your torso straight up during this movement. If you aren’t using dumbbells keep your hands on your hips. Pause for a moment, then push through your front heel to bring you body back up. As you’re coming back up step forward with your other foot to repeat the movement with the other leg. Start by positioning yourself in front of an elevated platform. For added resistance hold a dumbbell in each hand on each side of your body with your palms facing each other. Using your left leg, step onto the elevated platform. Push through your left heel to bring your body up and naturally bring your right leg up and onto the platform. Stand up straight and pause. Exhale through this entire motion. Now use your right leg to slowly step back down following with your left leg to come back to your starting position. Pulls Ups are one of the best bodyweight workouts you can do. As you get better at them you can add weights to challenge yourself even further. To start, approach a pull up bar. 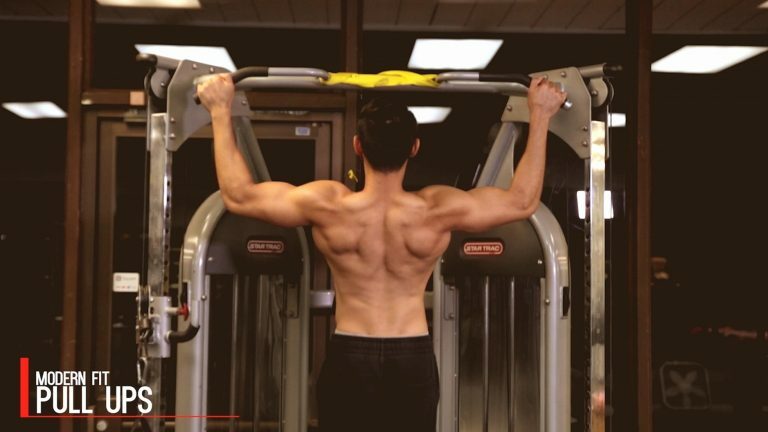 You can use a pull up bar that’s straight or curled. Grab the bar with your palms facing away from you. Based on the muscle groups you’re working you can either grip the bar wide, medium, close together. For the purposes of this demonstration and for most basic pull up exercises, default to a wide or medium grip. Pull yourself up slowly until your head is level with the bar. Breath out during this movement and keep your torso straight and elbows as into your body as possible. As you’re doing this movement your chest should stick out creating a nice curve in your lower back. Breathe in while slowly letting yourself back down. To begin, hang from a chin-up bar with your both arms extended at arms-length in top of you using either wide grip or a medium grip. The legs should be straight down with the pelvis rolled backwards. Raise your legs until the torso creates a 90-degree angle with the legs. Breath out as you perform this movement and hold the contraction for a second. Return back to your starting position while you inhale. Caution: Perform this exercise slowly and deliberately as it takes some time getting used to. Also, do not be hasty and try to use weights on the first trial; you’ll have enough in your hands by holding your weight and also learning how to balance yourself so that you avoid swinging your torso. As you get more advanced you can hold a dumbbell in between your feet. However, be very careful when adding weight to this exercise as if you add too much too quickly you could get a hernia. I'm a 100% plant based (vegan) athlete and trainer, and I want to prove that you can accomplish your fitness goals the way you want to and without having to give up your beliefs. Come train with me!